Observation - Fungi - UK and Ireland. Description: Small delicate flat cap with dark brown gills and lighter brown on top. Thin white stem with no ring. 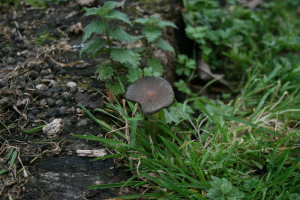 Small delicate flat cap with dark brown gills and lighter brown on top. Thin white stem with no ring.